To celebrate this moment of freedom, the residents of Coconut Grove will wrap hundreds of trees with joyous yellow ribbons throughout the Grove. Yellow wristbands, buttons and armbands will be worn. “We are tired of being ignored by the irresponsible people who own the Playhouse,” says Kurland. 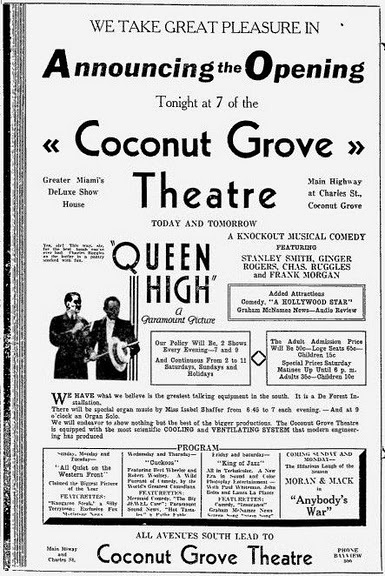 “We call upon City, County and State leaders to take action to resolve the ever-worsening situation of the vacant Coconut Grove Playhouse quickly and cooperatively,” says Meinhardt. Among politicians who will be invited to the Give It Back April 2 gathering will be Miami-Dade Mayor Carlos Gimenez, County Commissioner Xavier Suarez, Miami Mayor Thomas Regalado, City Commissioner Marc Sarnoff, and State Representative Carlos Lopez-Cantera. 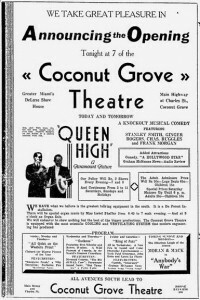 The Playhouse Board of Directors was freely given and accepted official ownership and responsibility for the Coconut Grove Playhouse in 2004 by the State of Florida. There was only one condition required in return for the gift by the State: The Playhouse Board of Directors must continue to present live theater in the revered landmark or they would lose ownership. With an estimated operating deficit of 4.3 million dollars, the Board closed the Playhouse on May 12, 2006 and it has remained closed and crumbling for six dark years since then. Be at the Playhouse on Monday, April 2, 5:30-6:30 p.m. and Bring a friend!